When you invest in high-quality, upholstered furniture, you want it to last. However, everyday wear and tear, unfortunate spills and even your pets might contribute to diminishing the appearance of your favorite pieces of furniture. Fortunately, your much-loved upholstered items can be well cared for thanks to some preventative maintenance and professional assistance. Follow these tips to extend the life of your upholstered furniture. Regular maintenance is an essential component in ensuring that you extend the life of your upholstered furniture. First, establish a regular vacuuming schedule for your furniture, much like you do for your floors. Vacuuming up crumbs and dirt regularly ensures that these potential stain causers don’t settle into the furniture and damage its appearance. On a similar note, keep that pet hair off of your furniture as best you can. Remove pet hair with a vacuum — try one that’s especially designed for pet hair — or invest in a handy sticky roller, which you can easily run across the furniture to pick up stray pet hairs and leave your upholstered furniture looking as good as new. Several products are available that can prevent small spills from turning into big problems. Modernistic’s line of upholstery protectors are a smart investment. Our 3M Scotchguard Carpet and Dupont Teflon Protectors stop liquid spills from absorbing into your upholstery. Instead, you can quickly blot up any spills and clean up stains, preventing any long-term damage to your furniture. Having one of these protectors applied to your upholstery now ensures that it can withstand any potential spills and stains that may occur in the future. Next, carefully consider the location of your upholstered furniture to extend its life. For instance, you might love to place that richly hued arm chair beside your bay window so that you can soak up the sun’s rays from the comfort of your home. However, that decision can spell disaster for your comfortable chair. Direct sunlight has the potential to fade upholstered furniture, and over time, you will watch as the fabric loses its vibrant hue and fades due to the sun’s rays. As a result, you should consider where you place upholstered furniture in your home, ideally setting it up in a spot that does not get hit with direct sunlight at any point in the day. Simple rearranging of your furniture might give your upholstered pieces many more years of use. Fortunately, when your upholstered furniture is in need of professional assistance, Modernistic is here to help. 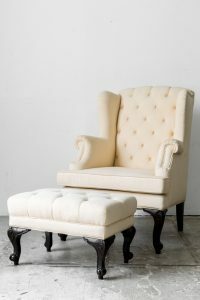 Deep cleaning your upholstered furniture can have long-lasting benefits for the appearance and durability of your piece. In a matter of minutes, our skilled professionals can revive your upholstered furniture, ensuring it looks its best for years to come. Thanks to a proven process and detailed checklist, our professional upholstery cleaning delivers real results. Set up an annual or biannual cleaning of your upholstered furniture today so that your favorite pieces thrive. At Modernistic, we’re here to help with all of your upholstered furniture needs. Let’s get started today!